Yasmine Elder, 24, is charged with first-degree murder of her boyfriend, Darrius Ellis, 26, after allegedly forcing him to drink bleach. Elder got into the fight with Ellis early Monday morning while sitting in a van. 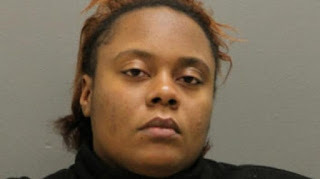 She was able to overpower him, then forced him down and poured bleach down his throat about 1:45 a.m., according to a Chicago police source. Officers found Ellis lying on the ground some time later early Monday, police said. He was taken to Stroger Hospital where he was pronounced dead at 3:26 a.m., according to the Cook County medical examiner's office. An autopsy determined Ellis died of "complications from forcible administration of a caustic substance," according to the Cook County medical examiner's office. His death was officially ruled a homicide. Elder was arrested about 5:30 p.m. Monday and is scheduled for a bond hearing Thursday. Relatives said Ellis was the father of a 5-year-old son. “He was a good kid,’’ said Ellis’ maternal grandfather, Clarence Hebron. “Everybody loved him."